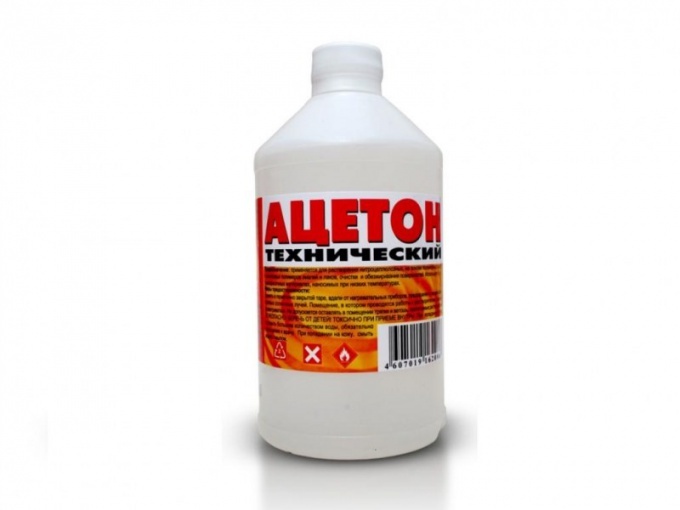 Acetone is a volatile, highly mobile, highly flammable liquid with a characteristic odor, no color. Household acetone is widely used in the repair, and for removing the effects of repair, such as stained hands, clothes and surfaces after using paint on any basis. To remove the smell of acetone, you should conduct a comprehensive procedure. To remove the smell of acetone with things cleaned of paint spots, put things in the open air in Sunny weather. Within 24 hours the smell will completely evaporate. Wash the product in the usual way with the use of synthetic detergents, add during the last rinse double dose of conditioning. To remove the smell of acetone from the products that can not be washed, after treatment spots to hang things outdoors. After 24 hours wipe off all the places treated with acetone cotton pad soaked in rubbing alcohol. After processing, place things in the open air for another 24 hours. This method completely removes the smell of acetone even without a subsequent washing, as the acetone evaporates when exposed to ultraviolet rays. If you were painting any surface in the apartment is a strong smell of acetone, open all Windows and doors. To ventilate the apartment a through flow of air for 24 hours. Acetone paint dries on any surface very quickly, but the smell disappears much more slowly. To permanently remove the smell of acetone with painted surfaces pour into the bucket seven liters of water, add 1 tablespoon of 70% vinegar, soak with a solution of clean microfiber cloth, wipe all the painted surface. This method will help you to completely get rid of the smell of acetone. If you removed the paint with acetone or other contamination from the hands or face, immediately wash the face and hands using the gel or any liquid detergent. Clean the skin with 6% vinegar or diluted lemon juice. To make juice, squeeze one lemon, dilute the juice with two parts water, apply the mixture on a cotton pad and wipe all treated with acetone place. After 5 minutes wash your hands and face, apply cream. Acetone is excreted from the body through the kidneys (in the urine acetone, and the smell of acetone), through the lungs( breath). What does that mean? Dehydration Lamfacialplastics diathesis a Shortage of glucose(not absorbed) and, accordingly, the appearance of acetone - one of the symptoms of diabetes. Acetone in the urine in diabetes. If the sugar content in the urine is higher than three percent, it may lead to the appearance of acetone in the body. Such patients need insulin. But acetone may appear in the case when the level of sugar in the blood is lowered. Most often the first symptom that draws attention the patient with diabetes is a smell of acetone from mouth.